It’s not about the food, it’s about the family. That’s a key message dished up by Food Network representatives about the “Restaurant Impossible” reality TV show’s episode filmed last week at Zoog's Caveman Cookin' in Port Hadlock. 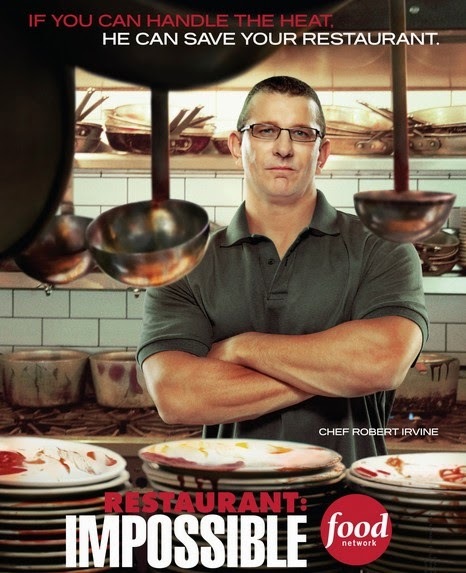 Celebrity chef Robert Irvine has filmed about 125 episodes of “Restaurant Impossible" since the program debuted in January of 2011. Clearly, what he encountered at Zoog's made an immediate impression. Irvine’s Twitter feed on Nov. 19 included this post: “Day two of my mission in Washington, Zoog's Caveman cookin'. To date the worst I have ever, ever seen. Seriously, wait till you see this one." The episode on Zoog's is slated to air on Feb. 4, 2015. 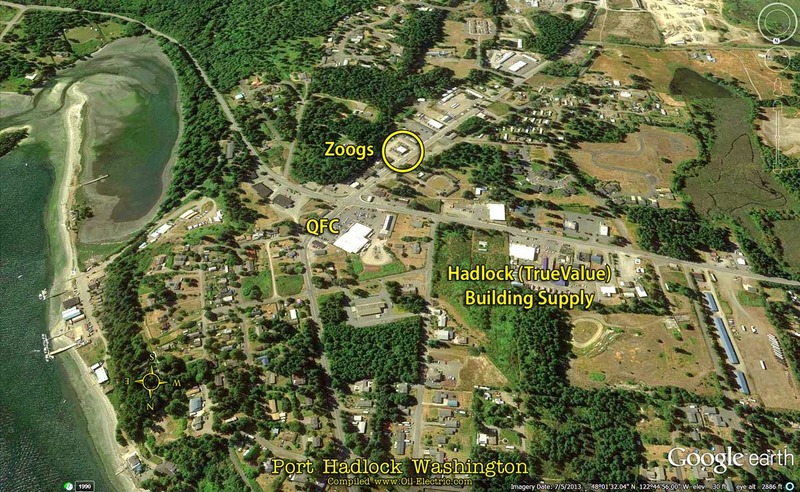 The sleepy hamlet of Port Hadlock Washington, population ~3,676, is on the map these days! 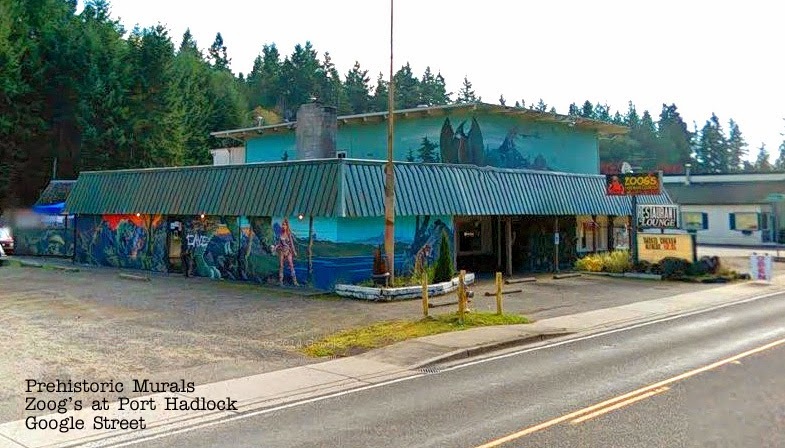 Located about 10 miles south of Port Townsend, Port Hadlock is playing host to a top rated cable TV show, Food Channels "Restaurant: Impossible," hosted by Chef Robert Irvine. 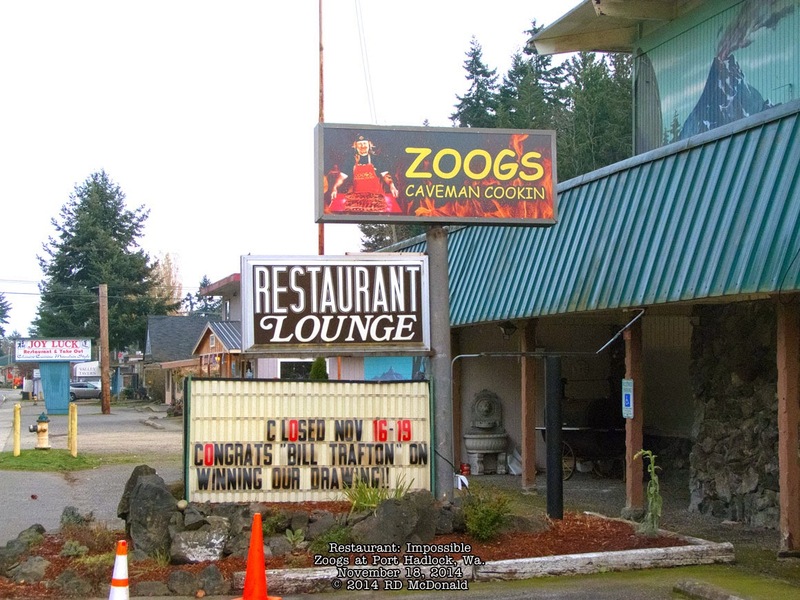 Robert's Restaurant Impossible is a place called Zoog's Caveman Cookin' Restaurant & Lounge. The premise of the show is that a flailing restaurant owner, faced with shuttering, reaches out for Chief Robert Irvine for help. Restauranteurs reach out to the Food Network for help to save a failing business. For the most part, not understanding the economics of running a business leads to failure. Incompetence and mismanagement are also in the failure model. 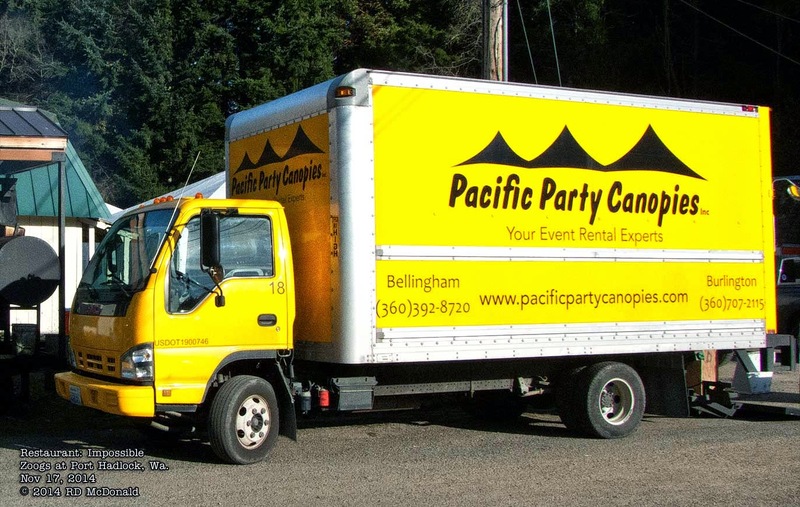 For many, despite heroic efforts to turn a troubled business into a success, fails. Usually they were so deep in debt, rescues was "Impossible." As an example, one of Gordon Ramsay's rescue's reverted back to his loosing business model, and within a year the restaurant became a bank! • and observes a "typical" customer service, wait staff interaction with customers. • behavior modification of management and staff. • revamping of menu to one that maximizes profit. • physical remodeling of structure. On the physical side of transformation,demolition and reconstruction recommended by Robert Irving, is supervised by his "Builder" Tom Bury and Interior Designers, of which there are several. To house and manage the resurrection, a Tent City is erected in which the tables, chairs and decorations are deposited for final disposition. While the Designer from time to time renovates tables and chairs, in many cases, worn out furnishings end up in huge dumpsters brought on site. The tents also house Tom's workshop where woodworking projects and electrical resurrecting is accomplished by the army of volunteers, with Robert giving the first blow! 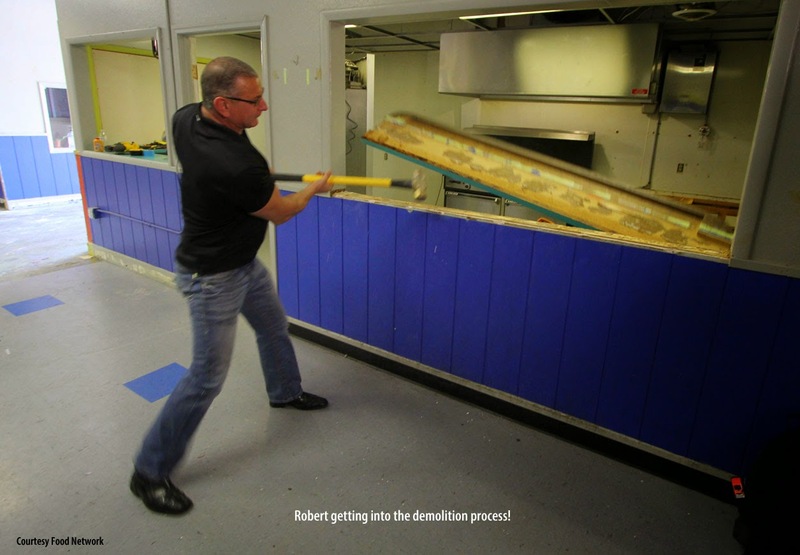 "Restaurant: Impossible" relies on local voluntary press coverage to announce the "target" restaurant, and through press coverage, solicits a task forces of volunteers, from those who know how to wield a paint brush, to licensed profession plumbers, electricians, and structural construction. 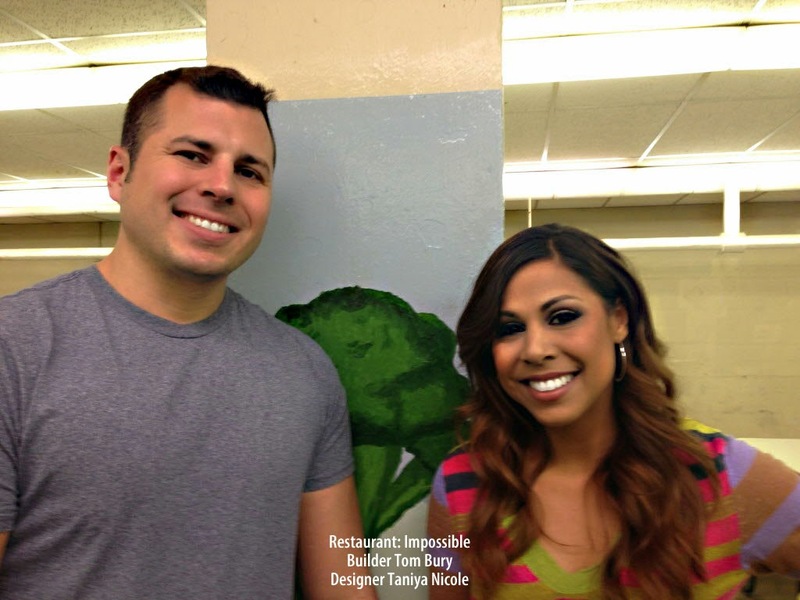 Last week, a local newspaper ran a story about the next "Restaurant: Impossible" candidate, Zoog's in Port Hadlock. The story included a link to the producers of the program, asking for volunteers. I volunteered, but was too late to get on board. 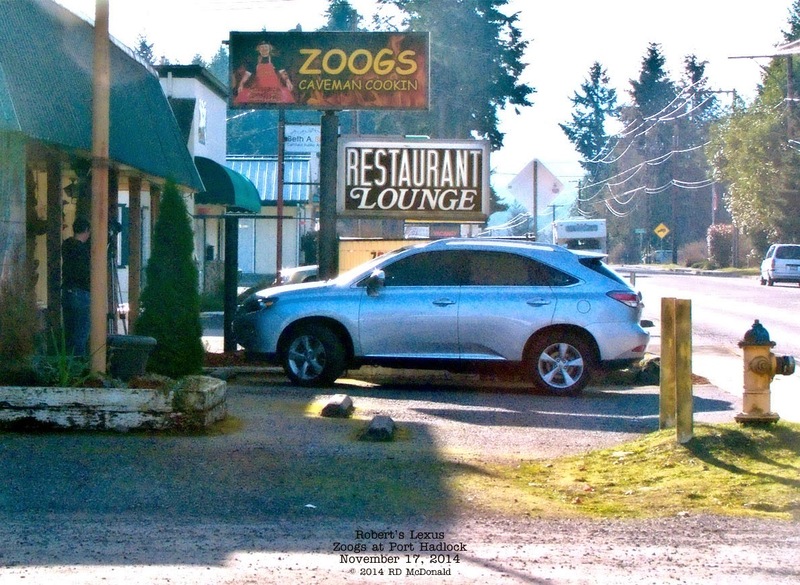 Monday afternoon (Nov 17, 2014) I drove down to Zoog's in Port Hadlock, naively hoping to meet Robert Irvine and Tom and the Design team. And shoot photos of the project in progress. 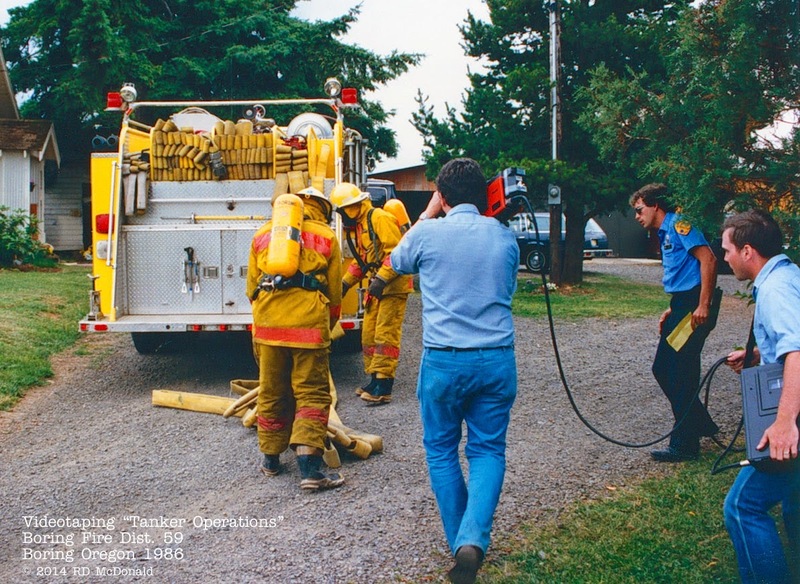 Having schlepped a video camera on my shoulder for more than 20 years, I was anxious to see the taping in progress. I spotted a woman crossing over from a parking lot, holding a brief case in her arms. Thinking she may be one of the producers, she said "No" she was one of the owners! Remembering the "Cone of Silence" between the owners the rest of the world, I inquired about Robert Irvine. She said, "That's him at the front door." There he was! Robert Irvine! As I raised my camera to take his photo - he was not more than 10 feet from me - a Producer raised his arm blocking my camera. "Food Network" does not allow you to take photos of him." The cameraman with him shooting his familiar one-take entrance into the restaurant! So I saw Robert Irvine for less than five seconds as he entered the facility with a trailing cameraman. I asked the Producer, who was nice enough, for access to shoot photos inside Zoog's, to shoot photos of the process, and to shoot photos of Tom Bury at work. The response to most of my questions, the stock answer, ""Food Network" does not allow this, that ... yada yada." I suddenly felt I was lurking around an ICBM Missile Silo! My shooting was confined to the exterior of the building. 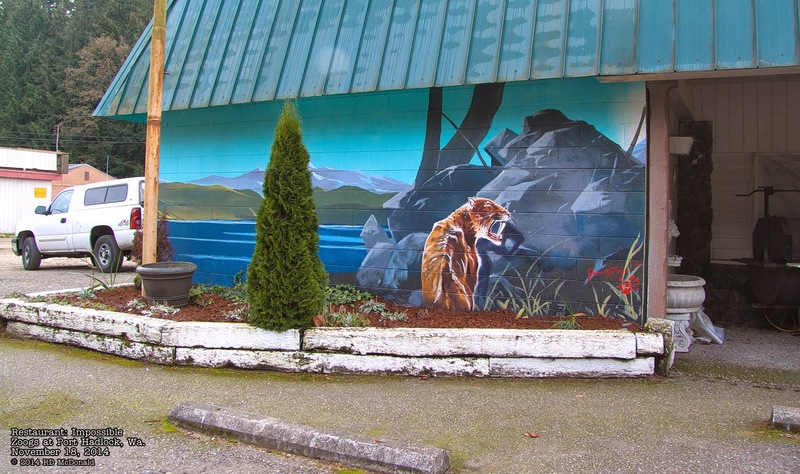 A large mural covers one side and part of the front of Zoog's. Painted by a local artisan, James Mayo, they remind me of the cheesy roadside attractions that proliferated the country back in the 40', 50's and 60's. 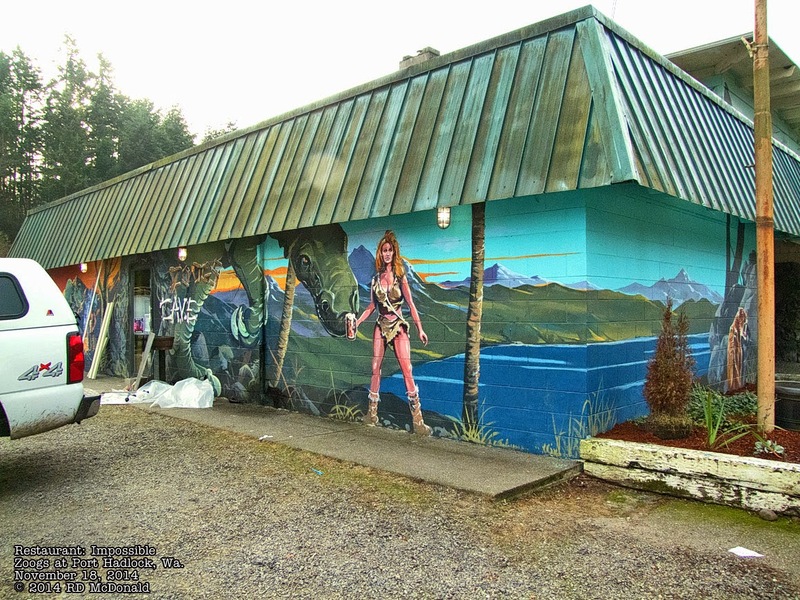 The murals, combined with a few unfavorable comments posted on Yelp and TripAdvisor, prompted me to return on to capture the murals before, as I believe, they will be painted over. 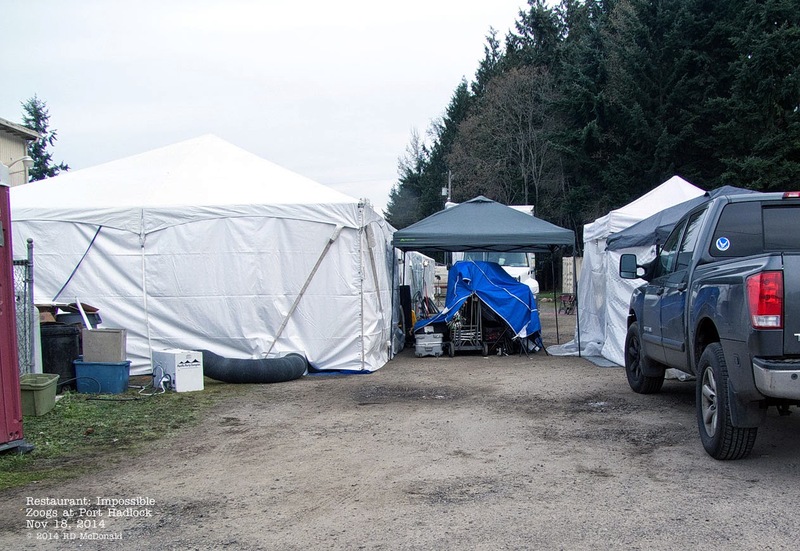 When I arrived, a Sheriff's K-9 unit was just packing up, having been charged with guarding the several tents behind the building, stuffed with the interior contents of the building, plus all the tools - saws and what not - utilized in the re-construction. The renovations should be completed Tuesday evening. At the end of each program, the "reveal" to management and staff, followed by a re-launch of the restaurant, showcasing the improvements to local community. According to the local press, dinner services for general public will commence on Thursday. 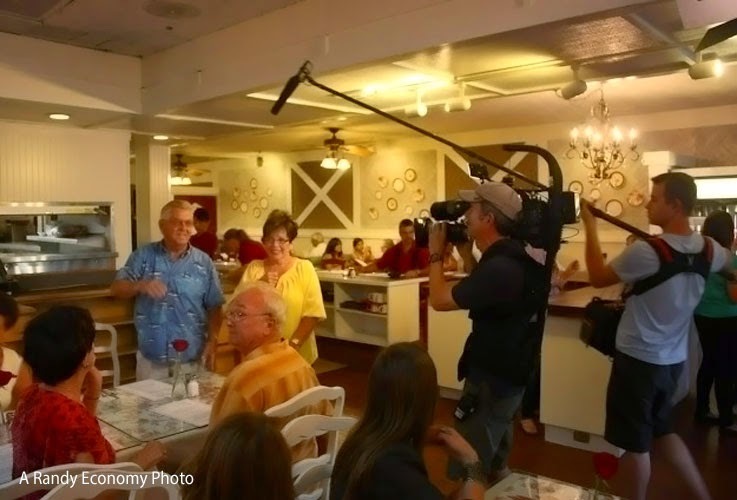 So in less than a week, the crew of "Restaurant: Impossible" will have spun the lives of the owners and staff completely upside down. According to one of the producers I chatted with, the "Zoog's" remake will be aired in February 2015.